The charter yacht that appeared in season two of the reality show Below Deck Mediterranean has a return engagement. This June, the superyacht Sirocco will appear on American television screens again, in season four. Drama aside, Sirocco has met with success in the charter market for many years. Her appearance on the show may have boosted business, the way the motoryacht BG saw an uptick after appearing on Below Deck (the “older sister,” if you will, to Below Deck Mediterranean). Regardless, she has several stand-out features to offer charter guests. For instance, rich-stained ebony figures prominently in lounging and dining areas as well as staterooms. Speaking of staterooms, the master suite spans the full beam aft on the upper deck, an unusual location for a 157-footer (47-meter). Named for the hot wind that blows across the ocean from Africa to Europe, the superyacht Sirocco fittingly has an African-themed interior, from headboards to accessories. Originally built by Heesen in 2006, the yacht received a refresh in 2013. 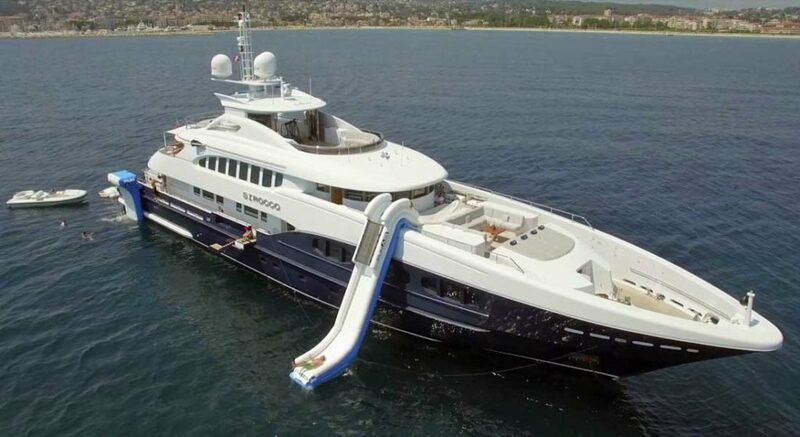 Viewers wishing to sample life aboard the superyacht Sirocco can charter her. Her weekly rate ranges from €180,000 to €205,000, plus expenses.